Evan and Melissa’s Food & Wine Top 25! 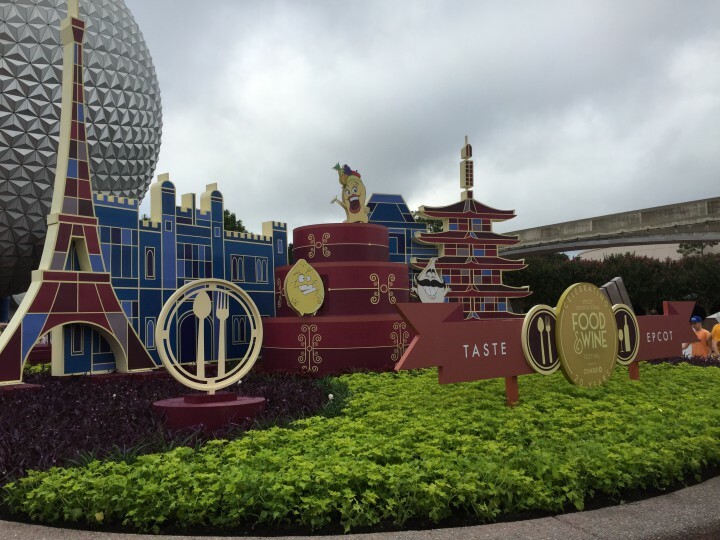 | It's "All in WDW"
Evan and Melissa’s Food & Wine Top 25! I just can’t do it. I can’t stop talking about Food & Wine. Neither can its fans! Take All in WDW readers Evan and Melissa Chaisson, for example. They’re so excited about their festival experience that, carved from the Readers’ Pre-Festival Top 25, they re-ordered and wrote their OWN Top 25! Great work, my friends! Take it away! Food & Wine should be attended by everyone – foodies and non-foodies alike. There is so much to do! The festival is much more than just eating and drinking. We were on vacation for eight days, and we attended the festival for six of them. Try to do the festival during the week – Monday, Tuesday, Wednesday or Thursday. The crowds are a lot less. We found that Friday and Saturday were filled with a ton of locals. They were a much louder bunch. 1 – Lamb Meatball – Packed full of flavor. Every bite was perfect. 2 – Grilled Lamb Chop – Melted off the bone. Almost #1! 3 – Kālua Pork Slider – Great spice. Bob’s right. Get extra mayo. 4 – Braised Short Ribs in Cabernet – Cooked perfectly. Melissa’s favorite. 5 – Grilled Beef Skewer – The sauce was “the boss” on this one. It made the dish! 6 – Roasted Verlasso Salmon – Best fish of the festival. 7 – “Le Cellier” Wild Mushroom Beef Filet Mignon – Always a contender. 8 – Beef Empanada – The inside filling was amazing. 10 – Berbere-style Beef Tenderloin Tips – Great spice … if you like spice. 11 – Cheddar Cheese Soup – Always a festival favorite … and, one of ours. 13 – Dole Whip with Bacardí Coconut Rum – Who doesn’t like a Dole Whip … especially with rum?! 14 – New York Strip – Not as good as we had hoped. 16 – Seared Sea Scallop – Being from Massachusetts, we’re used to great scallops. These? Not so much. 18 – Grilled Sweet and Spicy Bush Berry Shrimp – Chewy and over-cooked. 19 – Loaded Mac n’ Cheese with Nueske’s Pepper Bacon – Most over-rated dish at the festival. 20 – Gaoli Beef Slider – It was just OK.
21 – Ricotta & Zucchini Ravioli – Good filling, but it, too, was over-cooked. 22 – Lobster and Seafood Fisherman’s Pie – We were looking forward to this. It was a big disappointment. 23 – Potato and Leek Waffle with Beer-braised Beef – The waffle was too soggy. 24 – Belgium Waffle with Warm Chocolate Ganache – Sorry. The ganache tasted like Hershey’s chocolate syrup. 25 – New England Lobster Roll – Tasted like they used imitation lobster. Did I mention that we’re from New England? For us, worst dish at the festival. Sorry.